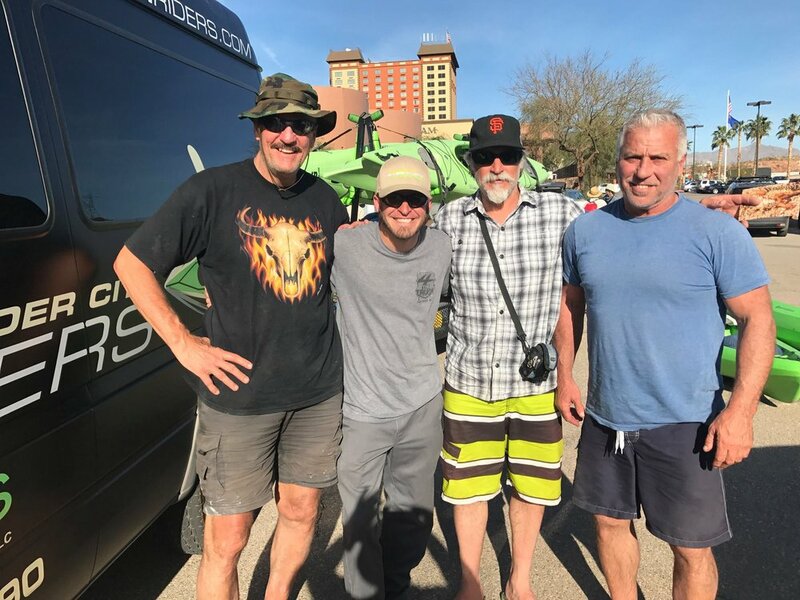 On March 9th, 2017, twenty-one men from the Men’s Center Los Angeles began a four-day, three-night journey in the Black Canyon on the Colorado River, between Arizona and Nevada, downstream from the Hoover Dam. The best way to describe the Black Canyon is that it is one of the most beautiful, majestic, and incredible places within the United States, if not the entire world. The Black Canyon is a 12-mile stretch of river that is home to big horn sheep, bald eagles, striped bass, and a variety of birds, reptiles and plants. 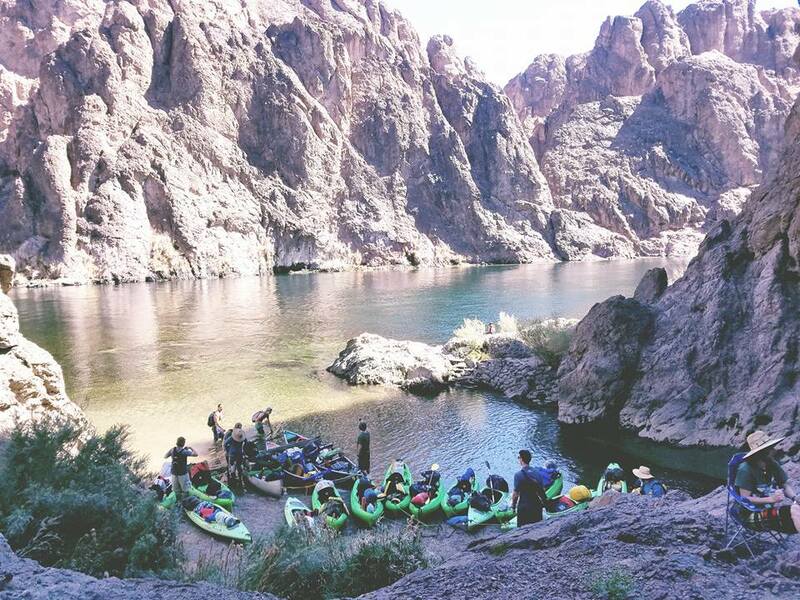 On most visits to the Black Canyon, one will find sun-baked mountains and canyons with very little vegetation and an abundance of emerald green, crystal clear water that averages about 58 degrees year round. With all of the rain the west coast has received this year, we witnessed an abundance of “green scape” that covered the mountains and canyons, with blossoming cactus and wild flowers everywhere. The weather conditions on the river were exceptional with temperatures in the mid-70s to low-80s during the day and mid to upper 50s during the evening. The water level on the river was high, but there was little to no current on the river, which made the maneuvering of the kayaks and canoes easy to handle. All in all the conditions on the river during the four days was exceptional. The Sacred Path Colorado River Retreat was the third time the Retreat was hosted in the Black Canyon. 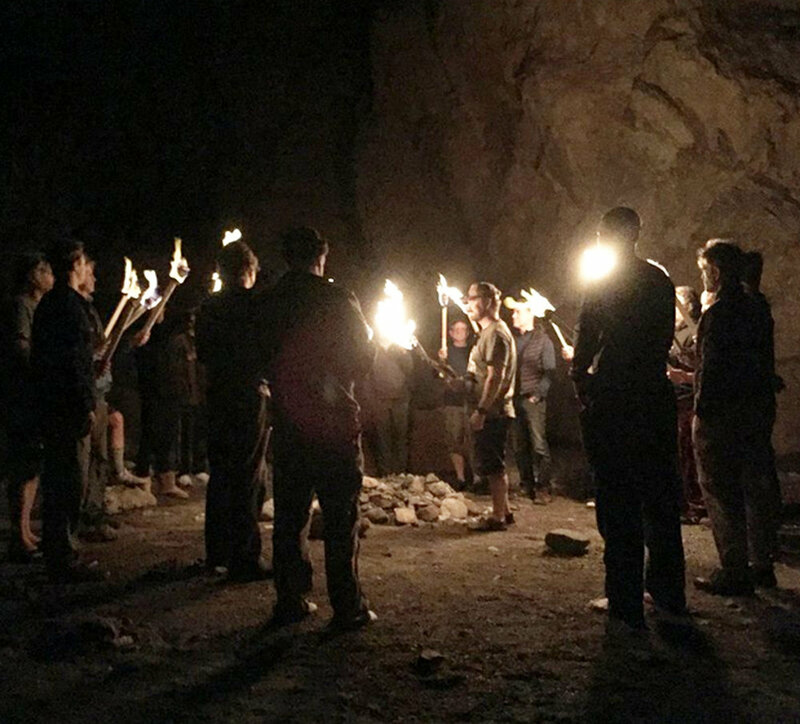 Several of the men had attended all three retreats including Clayton Norcross, Tommy Holmes and Daniel Stanton. The 2017 retreat was co-led by Rob Bruce, Dr. Michael Lewis, Scott Ewing and Daniel Stanton. The Sacred Path Colorado River Retreat began by launching our kayaks and canoes from the base of Hoover Dam, then taking most of the first day to experience the Sauna Cave, Gold Strike Canyon, which has a great walking trail, water falls, and hot springs, followed by a visit to “God’s Wall” which is too incredible to put into words. 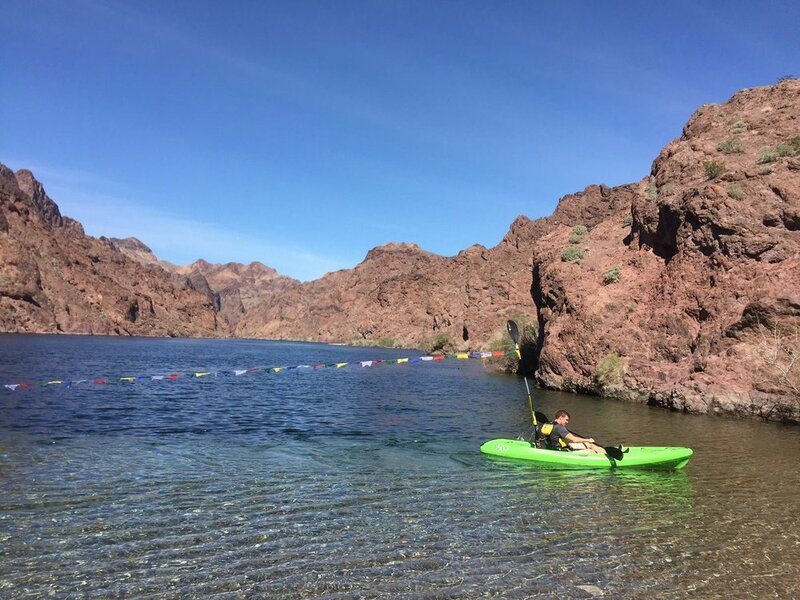 The Black Canyon is known for its natural Hot Springs, clear emerald green water, big horn sheep, bald eagles, calm water, and connecting with Nature and yourself in a way that you may not have ever experienced before. 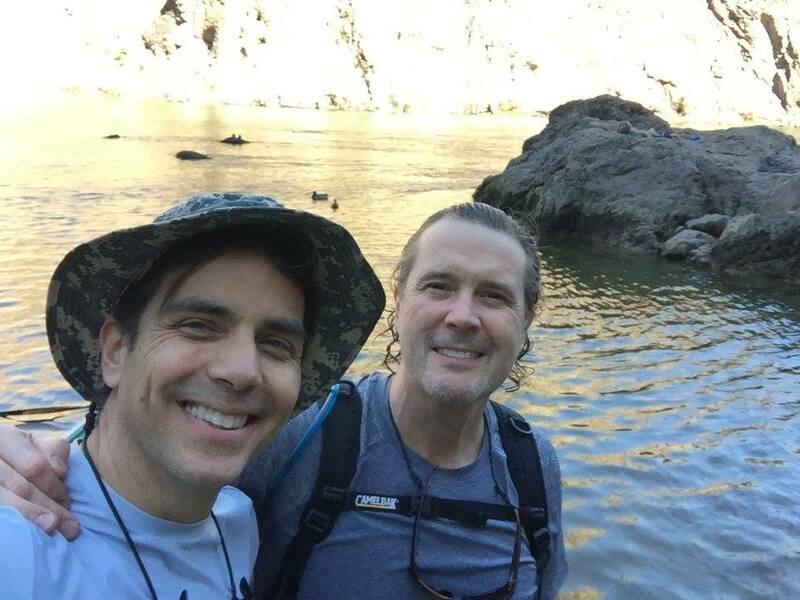 We enjoyed a nice leisurely pace where there were no schedules, no cell phones, no computers, just connection with Nature and yourself. We explored incredible caves that can only be accessed from the River, including the Emerald Cave which is a popular location to stop relax and enjoy the beauty. 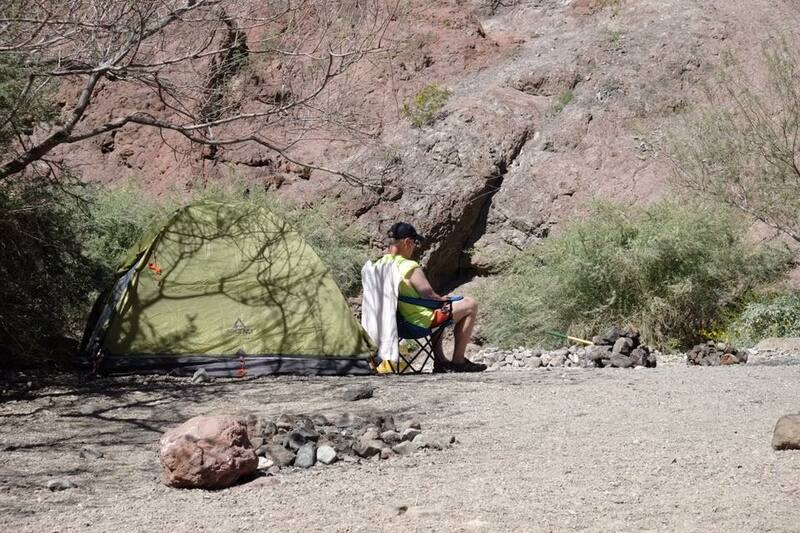 We arrived at our Base Camp, located at a place called the Arizona Hot Springs. 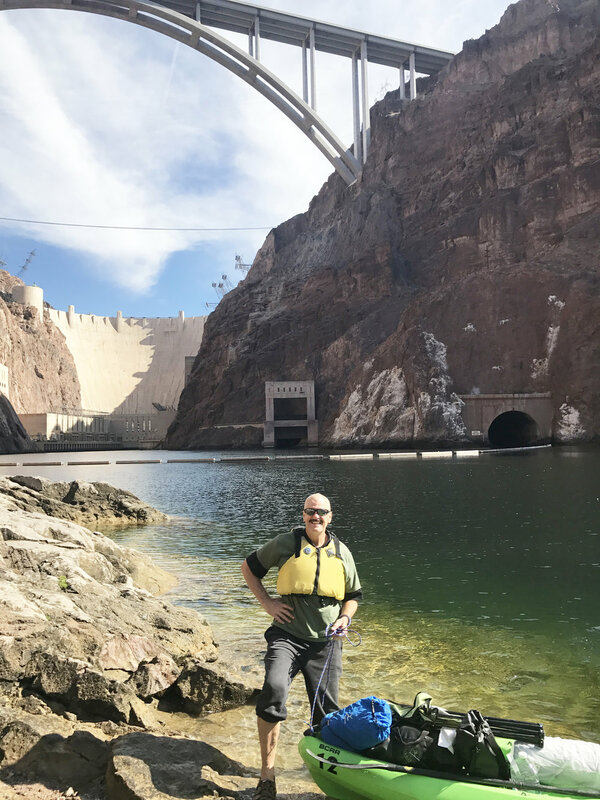 approximately four miles downstream from our launching point at the Hoover Dam, mid-afternoon where we unloaded our kayaks and canoes and set up our camp for the next three days. Some of the best Natural Hot Springs were located at base camp. There is also an incredible view of the River from a “look-out” point. At base camp we set up our Sweat Lodge, build a couple of fire pits, enjoyed our meals, shared stories, kicked back and relaxed, and woke up to the smells of fresh brewed coffee. We even saw some big horn sheep across the river from our camp. 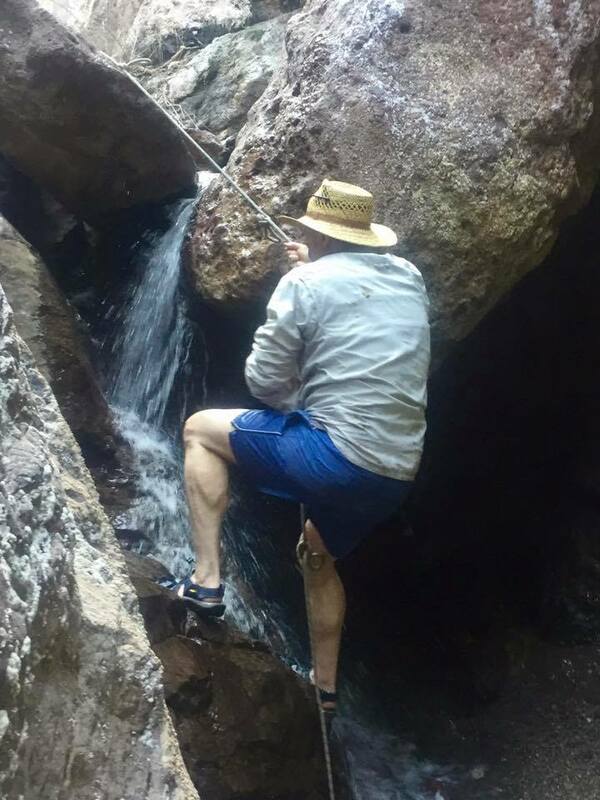 Each morning after our coffee, some light breakfast, and a morning dip in the natural hot springs, we enjoyed incredible hikes, jumped off rocks into a beautiful lagoon, and paddled upstream to explore more wonderful trails. The day was ours to seize. 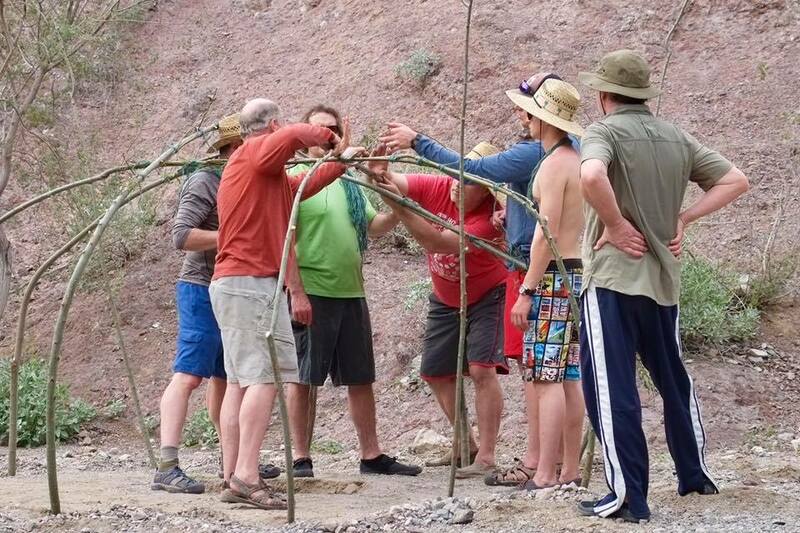 On Friday afternoon Dan Stanton and Bill Arena coordinated the building of the Sweat Lodge. With willow, twine, tools, tarps, and stones that were brought down river in the canoe barge we successfully built an incredible Lodge. 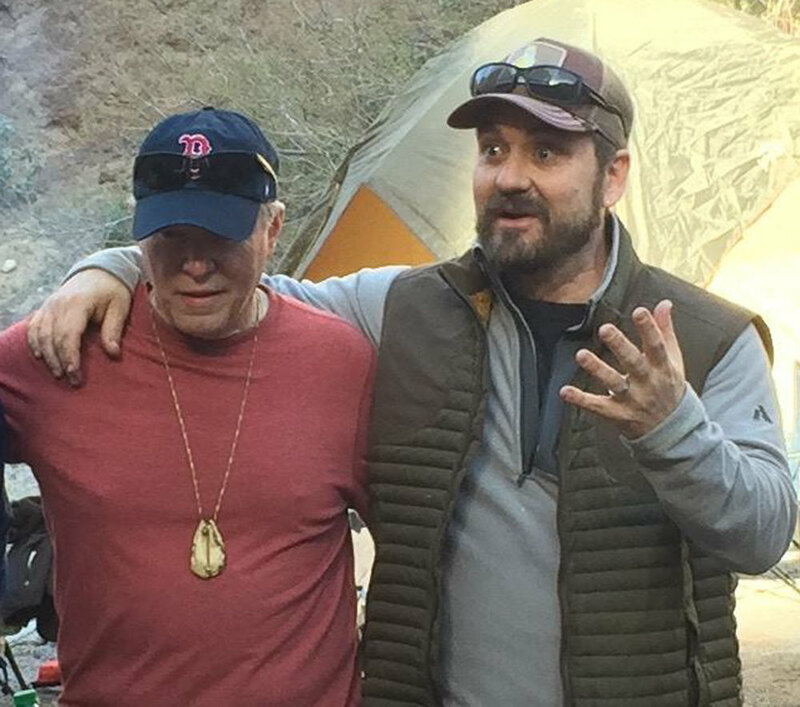 Dan and Bill led the Sweat Lodge ceremony on Friday and Saturday evening under the curiosity of a nearby father/daughter group of campers. On Saturday, Rob Bruce led a Tibetan prayer flag blessing ceremony where each man wrote the names of family members or those who have passed on their prayer flags. A heartfelt anthem about the Individual prayers that each man inscribed indelibly onto genuine Tibetan prayer flags which we then endeavored to stretch and fly across the 300-foot width between the sacred canyon walls. The prayer flags were then strung together to create this amazingly long prayer flag that was then connected to the back of a kayak, with a long pole mounted from a paddle. We will never forget the emotion of listening to Tommy Holmes’ soulful voice and stirring lyrics bound and echo off the river’s ancient walls while we witnessed Anthony Dimaggio heroically paddle his kayak in a warrior–like pilgrimage with our detailed, intimate prayers to the other side while Rob and Patrick Mannion helped feed the prayer flags as Anthony paddled across the river. Adam Zawadzki videoed the event on his Go Pro. 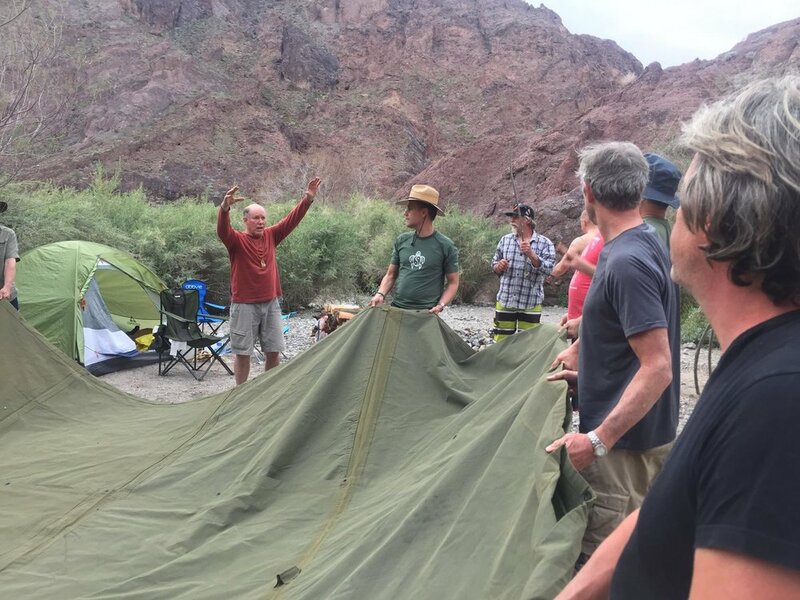 “Prayers across the River, Prayers across the World” are just a few of the passionate words our retreat brother & poet troubadour, Tommy Holmes, spontaneously crafted and played on his acoustic guitar for our band of brothers on the second day of our Colorado River adventure. Our intention, purpose and aim, quite literally, not just metaphorically, was for our collective prayers to bridge the divide and as Tibetan tradition suggests, be "blown by the wind to spread the good will and compassion” into the flow of the river and all pervading space throughout the world. So, as the flags soared and fluttered across the river and our moonscape like campsite during sunset and while a bonfire blazed under a full moon rise, Tommy shared his song one more time at the end of our traditional community talking stick time. There had been challenges during our 4-day hero’s journey in the wilderness. Brother Anthony didn’t know it until he returned home from the trip that had he had actually fractured his foot and still he soldiered on. 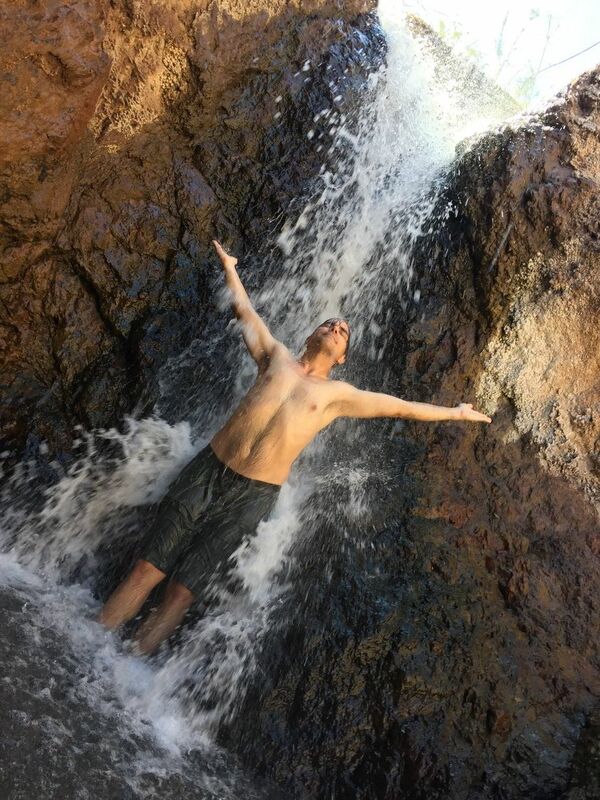 Brother Michael received some heart wrenching news and was required to hike back four miles to civilization. 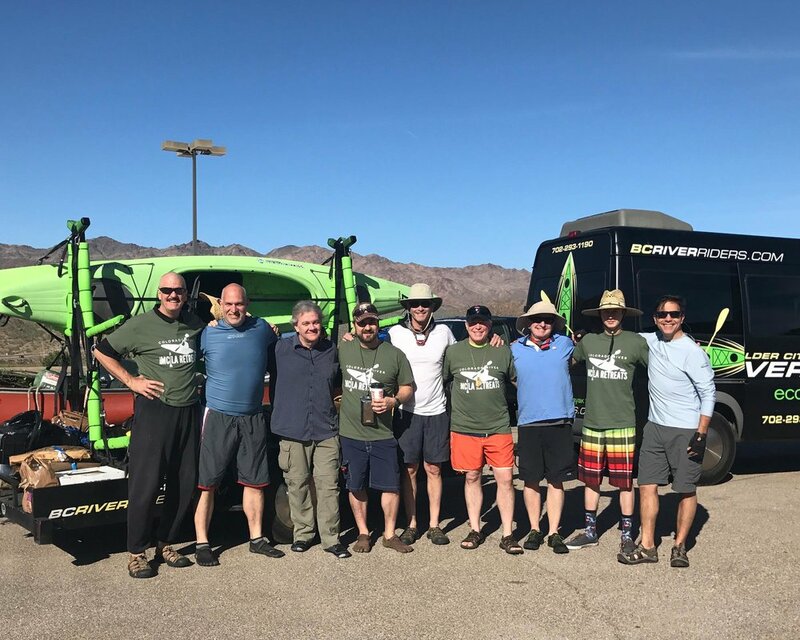 A platoon of brothers and spiritual warriors walked by his side to assure a safe return over the difficult terrain to the main road so that he could head home after receiving devastating medical news about his sister. 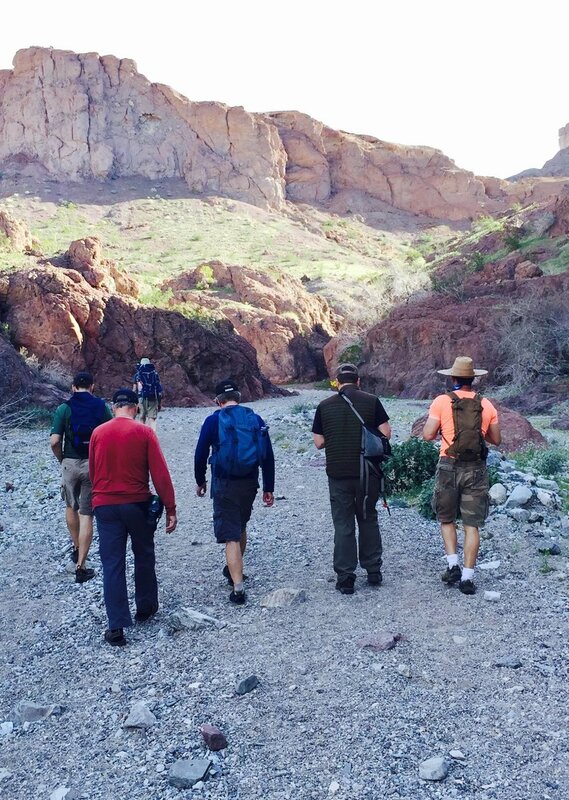 The men made sure Dr. Mike did not make that journey out of the canyon alone. 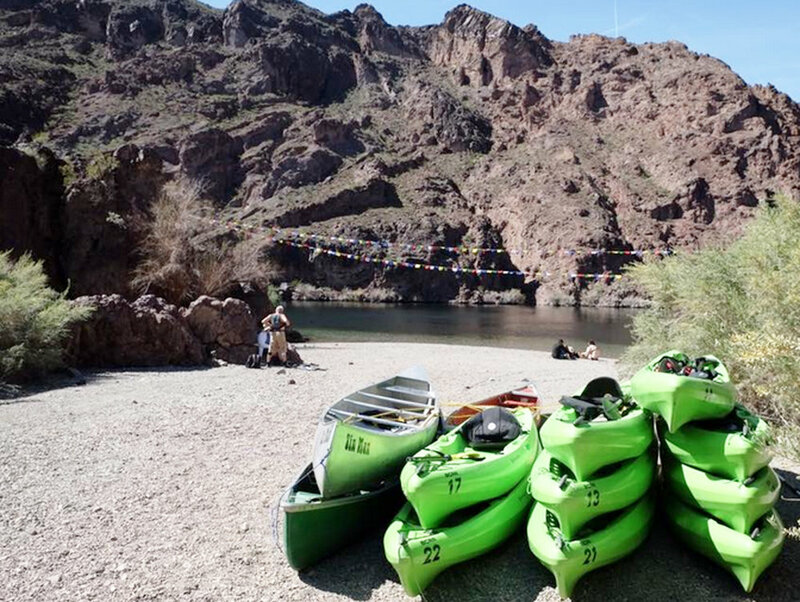 The entire Sacred Path Colorado River Retreat was a huge success and we could hear the words, “This was the Best retreat ever…” as we repacked our boats and headed home. There were many special moments during the weekend that the men will need to share for themselves. 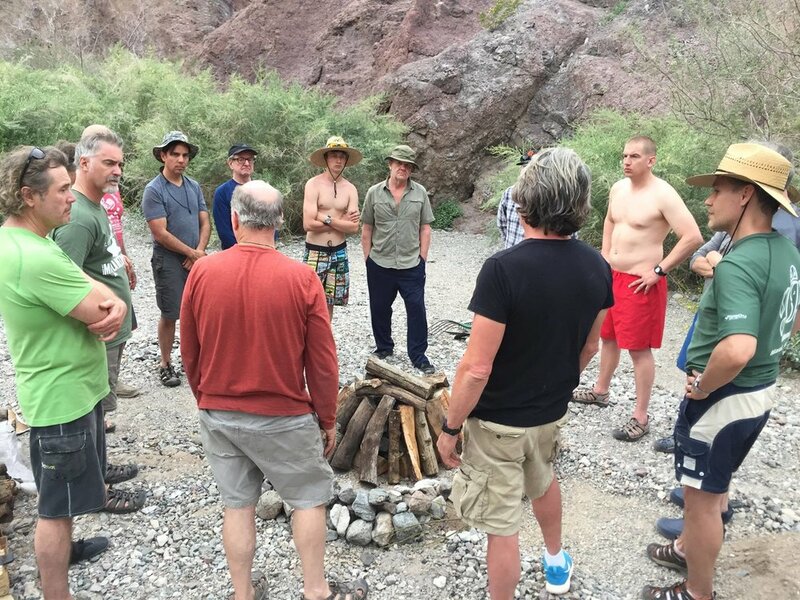 The men all wanted to make the Sacred Path Colorado River Retreat an annual Spring event and that will be discussed at a later date. In the meantime, check out the “Prayers across the River” retreat photos on our MCLA Facebook page. You’ll have to come to the Sacred Path Fall Retreat in October to hear the individual stories. 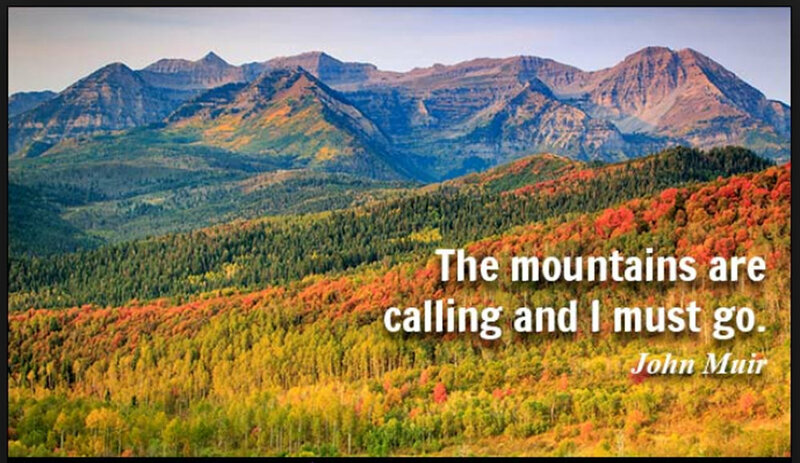 We thank everyone who accepted the challenge to get out of their comfort zone, to spend time with other good men out in the wilderness, to partake of the hero’s journey. It was an amazing retreat. We especially thank our founder and wayshower, Dr. Stephen Johnson, for creating the Men’s Center of Los Angeles over 30 years ago and leading us in such a powerful and soulful way. Dr. J’s mindful work has touched the hearts of all of us and empowered us to become better men. Ho, Mitakuye Oyasin (To All of Your Relations. 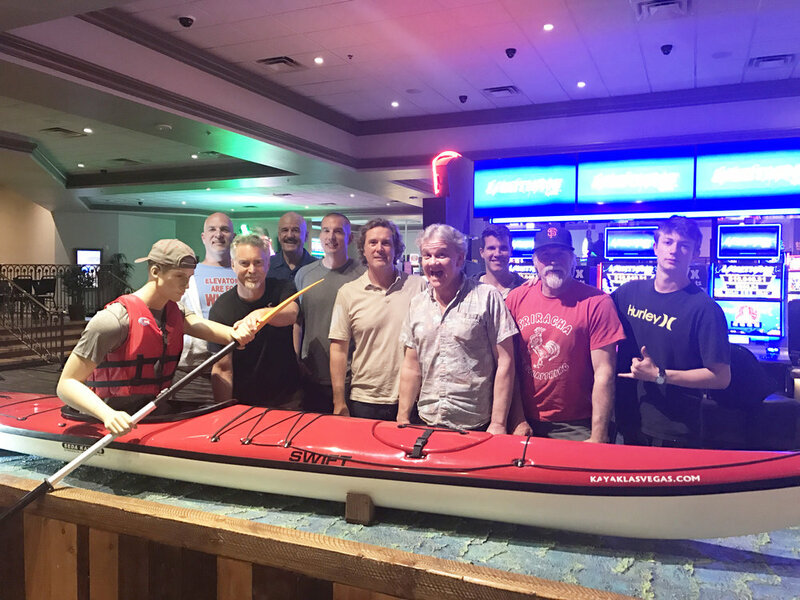 The 21 men of the 2017 Sacred Path Colorado River Men's Retreat extend our deepest thanks and sincere appreciation to Dr. Stephen Johnson, founder of the Men’s Center Los Angeles. Thank you Dr. J. for listening to your internal guidance and taking action on your dreams. Click here to see our video tribute to this man's incredible 30-year commitment to leadership. A look into 30 years of amazing Sacred Path Men's Retreats with Dr. Stephen Johnson.